I’m blogging from Camden, Maine, at the wonderful Pop!Tech conference. This year’s a special treat. My wife, the lovely Velveteen Rabbi, and I are team-blogging, trading off posts. You can read her posts on her website, or just read all of ours on the Pop!Tech site, where Michelle Riggen-Ransom has been doing brilliant work thus far. There’s lots of bloggers in the crowd and on twitter – follow the #poptech tag for lots of different perspectives. 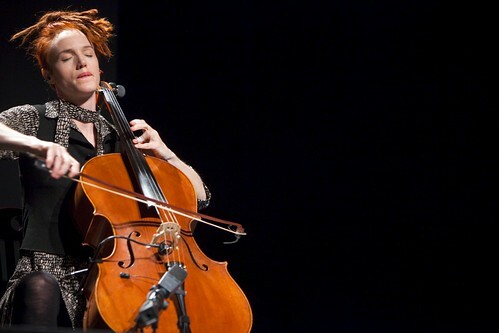 Zo� Keating is a cellist who’s more than a cellist. Formerly of rock cello band Rasputina, she’s now an innovative classical composer and performer. Using her instrument and a small pile of electronics – and heavy doses of creativity – she creates rich, layered textures that some have termed “avant-cello”. She opens the conference alone on stage, adding deep, lovely layers to a piece that resolves itself into “Amazing Grace”. Mac laptop at her side, tapping floor pedals as she goes, she draws themes from the cello, which repeat then recede into a shimmering background. It’s a meditative, slightly solelm and deeply beautiful start to the second day of the conference. Andrew Zolli, our host, mentions that he had initially invited Zo� to be part of the Pop!Tech audience, but that she’d been so moved by his idea of opening each day with American music that she volunteered to perform. There’s 3.5 billion people with mobile phones today, and an additional billion sharing phones. The people who don’t own phones spend an astonishing amount of money – 5-30% of their income – on phones. Waller suggests that you can reduce costs to an individual of $6 per person per month with a phone and increase their income by $5. We could get more mobile phones out there if we could reduce handset costs. To a very poor person, a $25 handset is as inaccesable as a $5000 handset would be to us. There’s disincentives for mobile operators to bring these people online as they’re low revenue users. Waller’s big idea is to put mobile phone functionality into a cloud. Users who share a mobile phone can have independent lines, but access that account from everywhere. This model might actually make significant money for mobile phone operators. Working with NGOs, universities and testing in labs in South Africa, the system is ready to go, and Waller believes that the model could serve a million African customers this year. This entry was posted in Poptech '09 and tagged Africa, cello, mobile, music, social venture. Bookmark the permalink. Thanks for the Blog on Zoe’s fantastic musical feast and my PopTech presentation. Looking forward to your future blogs.